This recipe is just a guide – use whichever vegetables you have to hand and dressing quantities that suit your taste. This is a great way to use up those winter veg that might otherwise hang around in the fridge too long, and keeps well in the fridge for a couple of days. Eating them raw makes a refreshing change, too. 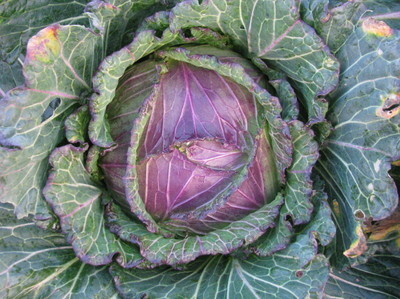 The rainbow colours are pretty, and the salad looks stunning served in a bowl lined with the beautiful outer leaves of a large January King cabbage, which are sea green fringed with purple. Peel the vegetables and cut them into very thin matchsticks. If you have a mandolin or processor with a julienne attachment, by all means use it. Or you could coarsely grate the root vegetables and slice the others thinly. Otherwise take the opportunity to practise your knife skills! Toss the vegetables with the dressing ingredients of your choice, tasting as you go. It will need plenty of salt and plenty of zing, with a good mustard kick. Adding yoghurt will give it a creamy consistency. Let sit for at least an hour before serving.